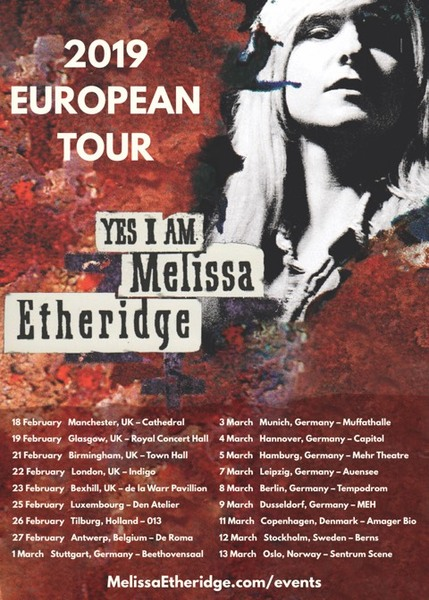 In celebration of the 25th anniversary of her iconic album, Yes I Am, Melissa Etheridge has announced today a European headline tour. The “Yes I Am” European tour will kick off in Manchester on February 18 and will take Melissa to cities across Europe including Berlin, Copenhagen, Stockholm, and more, before wrapping up in Oslo on March 13. VIP pre-sale for the tour begins on September 26 and public on sale is September 28. There will be two special VIP packages available for all dates – Melissa Etheridge VIP Meet & Greet FRONT FIVE ROWS and Melissa Etheridge VIP Meet & Greet Upgrade package. More information on all packages is available HERE.